In a bowl mix together the flour, cocoa, salt, baking powder and bicarbonate of soda. In an electric mixer beat together the butter and sugar until light and fluffy. Mix the flour mixture through the batter and add the buttermilk. Fold through half the pecans and pour the mixture into the loaf tin. 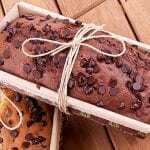 Bake the loaf for 20 minutes and top with the chocolate chips and other half of the pecan nuts. Bake for another 35 minutes. Remove from the tin and cool. For the butter: Melt the chocolate carefully and allow to cool slightly. Beat in the butter and the vanilla. Serve the bread and butter together.